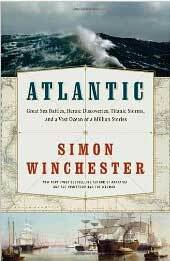 Simon Winchester has written an entralling book about the greatest ocean in the world, the Atlantic. We are well aware that 70% of the world's surface is covered by water, and the great Atlantic Ocean, both north and south, accounts for 57.15 % of that total. As we traverse its history, it may start as a placid, calm body of water, at the left hand edge of our Datum Line, but as it moves to the right it can become a frightening ocean whipped up by gale force winds, and a danger to all sailors who dare to sail upon it. In the days of sail, of course all Seamen depended on these winds to propel their vessel to make a land fall on one or other side of the Atlantic. It also brought its attendant dangers, the real possibility of ship wreck, and death at sea. The Beauford Wind Scale was designed in 1806 by Admiral Sir Francis Beauford, to give us a measure of the intensity of the wind as ships ply the different oceans of the world. Wind direction shown by smoke-drift, but not by wind vanes. Leaves, twigs in constant motion; wind extends light flag. Large branches in motion; whistling heard in telephone wires; umbrellas hard to use. Slight structural damage occurs (chimney pots and roof tiles removed). Very rarely experienced on land; accompanied by widespread damage. Another measure of the wind strength is by means of an Anenometer. It can be as primitive as a simple wind vane to the sophicated hot wire or hot bead, here a thin wire or bead is heated then as the intensity of the wind increases, it cools the heated wire. There is a direct correlation between the wind intensity and the heat of the wire. Wind Meters and Wind Measurement. Wind Speed Measurement is something that is conducted by professionals and amateurs from all walks of life. Cup anemometers are a common type of anemometer used worldwide. The cup anemometer is inexpensive to manufacture and is suitable for many standard wind measurement applications. The pocket Anemometer is a popular hand held anemometer that is used by individuals in mining, fire fighting and crop spraying, dusting industry, sport enthusiasts and educational institutions. Those interested in wind tunnel experiments especially velocity experiments that have to do with the aviation industry and aerodynamics testing for moving vehicles and structures will be familiar with the Laser Doppler. The Windmill anemometer is a propeller anemometer. Normally a wind vane combines a propeller and a tail for more accurate wind speed and direction measurements. These are tubes made out of material and visually indicate wind direction and relative wind speed. They are a common sight at airports and places where it gets windy. A wind rose is a diagrammatic explanation of the distribution of wind speed and wind direction. A qualified meteorologist will know how to construct and interpret a wind rose. An ultrasonic anemometer has sensors/transducers that send and receive sonic pulses across fixed paths. The greater the number and the better arrangement of the fixed paths. Wind Turbines use the force of the wind acting on turbine blades which are connected to a gearbox and drives an electrical generator. Modern wind turbines can output more energy. Apart from the Wind Tunnel Testing for the Anemometers (most likely compared to calibrated pitot tubes) the manufacturer's performance specification needs to be considered . It is not only the overall accuracy for some applications but the accuracy expressed at lower and higher velocities. The Thermal Air Flow Meter or Hot Wire Anemometer can measure air speed/air velocity with a single probe . At the end of the rod there is a thermal hot wire or "hot bead" which is cooled by the air flow and the cooling effect has a direct relationship with the velocity of the air it is measuring. The Wind Chill Factor caused people to feel colder in the body. People can feel colder than the outside air temperature really is. Both temperature and wind cause heat loss from body surfaces. Electric power generating systems convert the mechanical energy of moving parts into electrical energy. Electrical power can be expressed in units such as the British Thermal Units Horsepower. Wind speed and wind direction is of interest not only to the meteorological experts but also to others . Wind speed and wind direction data can help aircraft landing systems. Thus wind plays an important role in our lives both on land and at sea, but nowhere is it such an important element as in the mighty and dangerous Atlantic Ocean. To sail its breadth can be a shock, when its in an ugly mood. A fearsome sight that can pierce one to your very core. It can certainly put both man and his vessel to the test. You both hope and pray to survive its awful majesty. You hold on, and trust you will outlast out this storm and strife. At least the violent storm is on your side as the enemy is not in sight. A crew of thirteen in need of help, but how much longer can their aircraft float? A huge wave breaks up this very large Flying Boat. Nine are safe, but four drift away to drown, and we have lost those few. This helpless feeling will my lifetime remain a sadness and worry me. The toss of a coin, decides who lives, who ends their life? One can but utter up a sigh.